Maple Lake is a city in Wright County, Minnesota. Minnesota State Highway 55 serves as a main route in the city. According to the United States Census Bureau, the city has a total area of 2.26 square miles (5.85 km2); 2.23 square miles (5.78 km2) is land and 0.03 square miles (0.08 km2) is water. The elevation is 1,053 ft (321 m) above sea level. As of the census of 2010, there were 2,059 people, 773 households, and 528 families residing in the city. The population density was 923.3 inhabitants per square mile (356.5/km2). There were 822 housing units at an average density of 368.6 per square mile (142.3/km2). The racial makeup of the city was 97.2% White, 0.7% African American, 0.2% Native American, 0.3% Asian, 0.2% from other races, and 1.4% from two or more races. Hispanic or Latino of any race were 0.9% of the population. There were 773 households of which 41.0% had children under the age of 18 living with them, 52.8% were married couples living together, 10.3% had a female householder with no husband present, 5.2% had a male householder with no wife present, and 31.7% were non-families. 27.0% of all households were made up of individuals and 9.9% had someone living alone who was 65 years of age or older. The average household size was 2.63 and the average family size was 3.22. The median age in the city was 32.3 years. 31% of residents were under the age of 18; 7.3% were between the ages of 18 and 24; 29.9% were from 25 to 44; 22.4% were from 45 to 64; and 9.3% were 65 years of age or older. The gender makeup of the city was 48.7% male and 51.3% female. Maple Lake is situated in a part of central Minnesota once inhabited by the Ojibwe Indians. In 1855 the Government revoked the treaty with the Winnebago and opened up Wright County for non-Indian settlers. 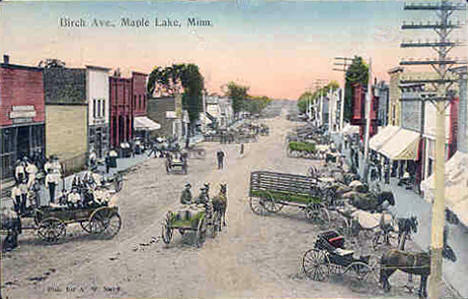 The history of the city of Maple Lake begins in the mid 1850s. Early maps of Wright County illustrate a number of villages which included a city labeled "Geneva" located on the northwest shore on Maple Lake. Early pioneers came to Maple Lake to farm but, in 1857, C. H. Hackett surveyed a 200 plat and named it "Geneva". The 1857 severe depression caused a financial panic which resulted in failure of the development of the city of "Geneva". The city of "Geneva" never materialized but the town site of Maple Lake was established in 1858 with the establishment of a mail site. The Irish migrating from Clare County Ireland began to influx into Maple Lake in the late 1850s and early 1860s. With this early group of Irish immigrants, came Patrick O'Loughlin Sr. who would become the pioneer founder of the present day village of Maple Lake. O'Loughlin saw the establishment of the village but his son-in-law, James Madigan, platted the village of Maple Lake in 1886 and began to sell lots in 1887. The first lots were sold to John Roehrenbach who opened a dry goods and groceries store on a street known as "Main Street". Today this site is the location of the Maple Lake City Hall. Other businesses were developed in 1888. The development of the city spurred the development of farming, the expansion of the "Soo Line" railroad through the city as well as the opening of an elevator in 1889. Rumors of the incorporation of the village of Maple Lake surfaced in 1888 but the actual incorporation was completed in 1890. Following the incorporation, Martin O'Loughlin was elected to serve as Mayor and the village began developing ordinances in January 1891. The first ordinance passed by the council was the establishment of the city seal. The 1890s brought the growth in the number of businesses, establishment of a school as well as in the number of businesses burned down by fire. In 1896, the Maple Lake Cooperative Dairy Association was formed for farmers dairy products. Early Maple Lake was established as a center for wood milling and related wood products. The turn of the century brought the continued development of businesses and the flourishing of farming. In 1900, he business district was taking shape but changed by fire. One of the businesses that burned in 1900 was the Jude Hotel. The turn of the century also brought the development of streets, construction of sidewalks from the business district to the railroad depot and other civic improvements. The village council paid $1,000 for land to build a community park and today this site of central park. 1903 brought the construction of street lights. In 1906, Security State Bank opened. The 1910s brought the construction of a water tower, water mains and sewers; the arrival of the first car; and, the "Spanish Influenza" which caused epidemic death. The 1920s brought the opening of the Maple Lake Garage and the Maple Lake Pavilion. The 1930s brought the donation of land by the Maple Lake Improvement Club to entice the construction of a power plant by United Power Association and the headquarters of Wright-Hennepin Electrical Cooperative. 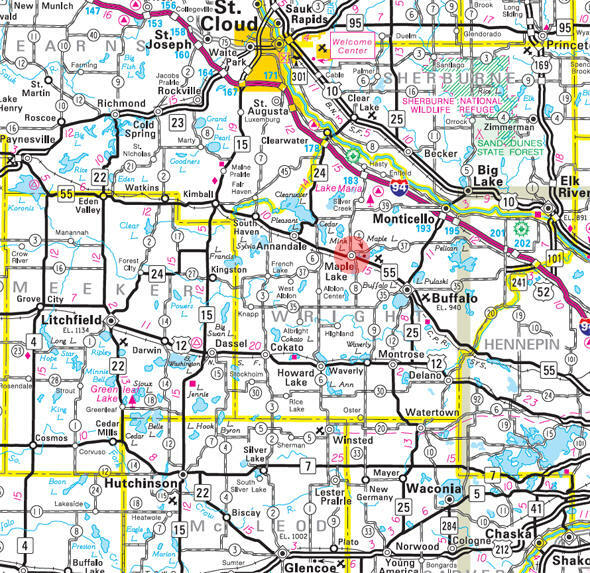 The 1930s also brought the paving of Olson Memorial Highway (Minnesota Highway 55). Baseball was the primary form of entertainment for the people of Maple Lake in the 1930s. The 1940s events include the "Armistice Day" blizzard on November 11, 1940; the tornado of 1942 that damaged or destroyed many downtown buildings; the passing of the "old guard" who were responsible for the incorporation; and, the construction or Irish Stadium on a piece of land obtained from Herb Bolduan. This stadium has hosted numerous state high school, state babe Ruth, and state amateur baseball tournaments. 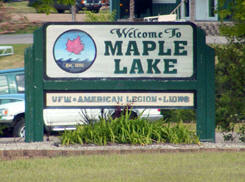 During the 1950s and 1960s, Maple Lake experienced great shifts in its economy. Agriculture declined as a percentage of employment with the shift to manufacturing and service employment. The population also began to become migratory with significant shifts of both in-migrants and out-migrants. The 1970s brought the Maplewood Addition for residential development including the Maple Manor Senior Citizen Housing Development. A second unit, Maple Manor West was built and opened in 1981. The 1980s included the Jude Industrial Park that initiated the extension of utilities to northwest Maple Lake and sites for the development of Bernatello's Pizza, Cedar Lake Engineering, Jude Candy and Tobacco, Sun Patio Pontoon and Elletson Bowl and Recreation. The 1990s have included the expansion of Jude Industrial Park to the west allowing the expansion of Sun Patio/Warrior Boats, Cedar Lake Engineering as well as sites for new industries like Rhino Roto Mold, Elletson Manufacturing, Product Technologies Inc., Dental Resources Inc., KWM Manufacturing and H & H Sports. Residential development was spurred by the platting and development of the Donald C. Jude Addition and the Donald & Victor Jude Addition both located in north central Maple Lake. Commercial development in the 1990s included Roger's Amoco, Security State Bank branch facility, H & H Sports Shop, Madigans, Pauman Our Own Hardware, VFW, and the American Legion. Plans are currently underway to accommodate additional residential, commercial and industrial development. Many people also enjoy sporting events in Laker Stadium and the varsity football field. MAPLE LAKE Township, first settled in 1856 and organized in 1858, received the name of its largest lake, which is bordered by woodlands of the sugar maple. The city in section 6, bearing the township name, was founded in 1856 and was incorporated on March 20, 1858, December 24, 1890, and February 14, 1913. The post office began in 1858, with Evan B. McCord as postmaster; it had a station of the Soo Line. The Maple Lake Business Directory is Coming Soon!